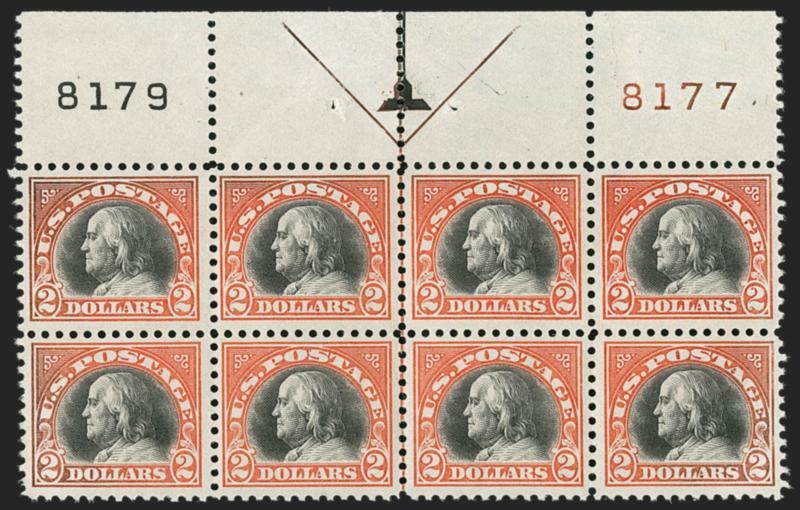 During the course of production of the normal 2¢ plate--Plate 7942--three subjects were noted to be weakly transferred: Positions 74 and 84 in the upper left quadrant, and Position 18 in the lower right. The plate was sent back to the siderographer, who burnished out the three entries and re-entered them. Instead of the 2¢ transfer roll, he mistakenly used the 5¢ transfer roll for the 2¢ plate. 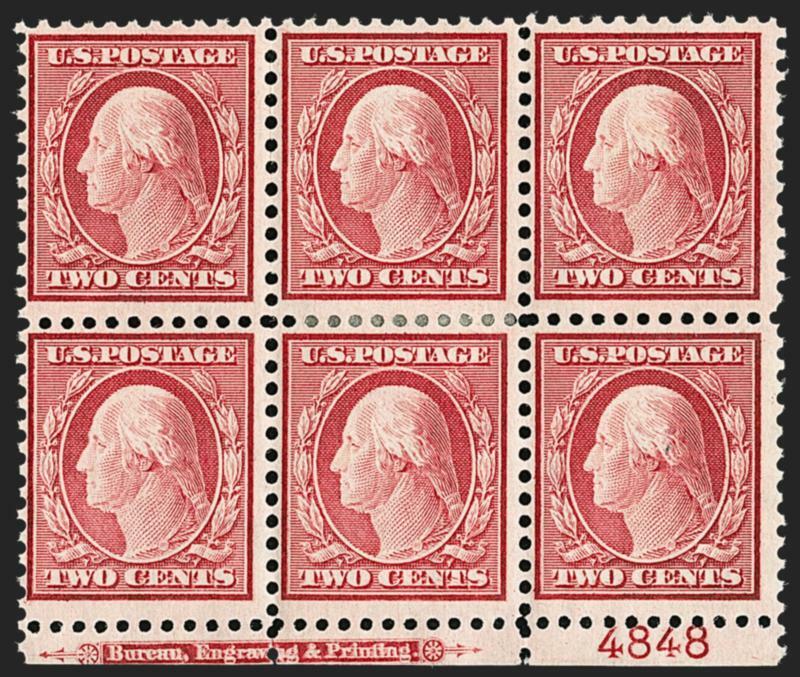 The sheets were printed in the normal 2¢ Red color, but three stamps in each sheet of 400 were 5¢ stamps, which were normally printed in blue--that is how the 5¢ Red errors came to be. 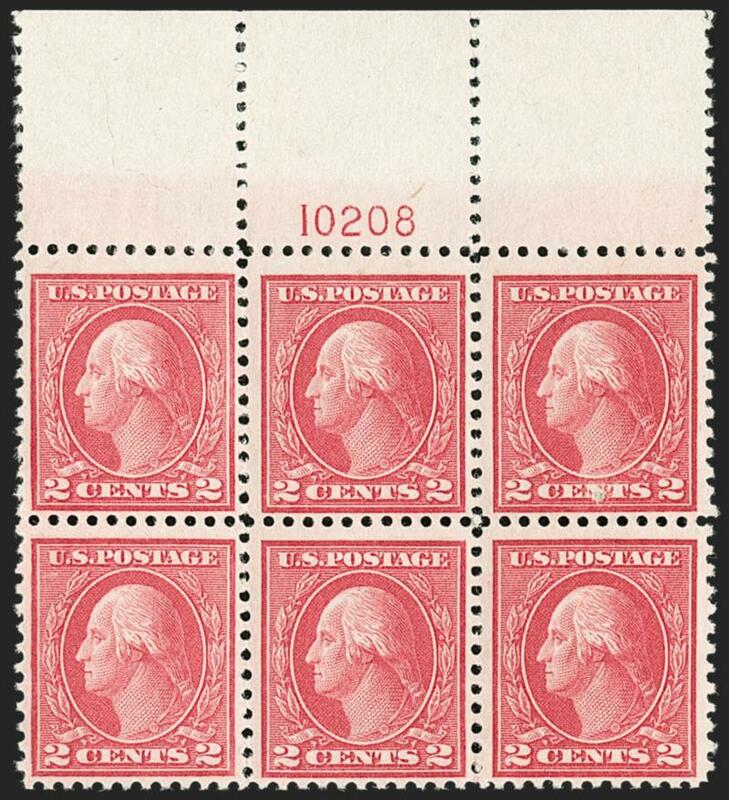 The misentered plate and the sheets produced from it passed unnoticed, and the 5¢ error stamps were issued to the public. 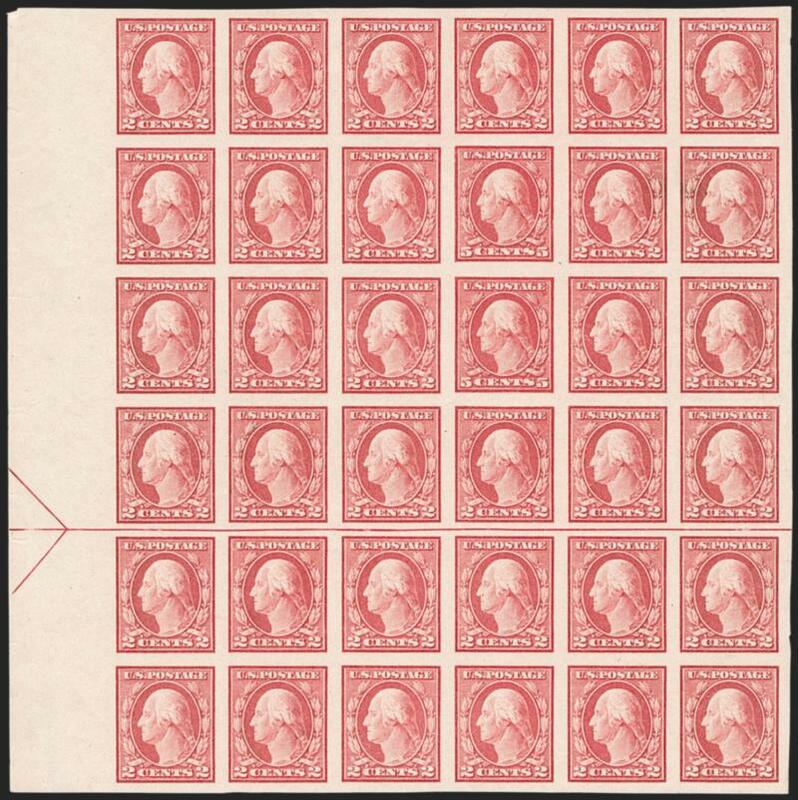 The largest number of sheets to reach collectors were perforated 11 (Scott 505). 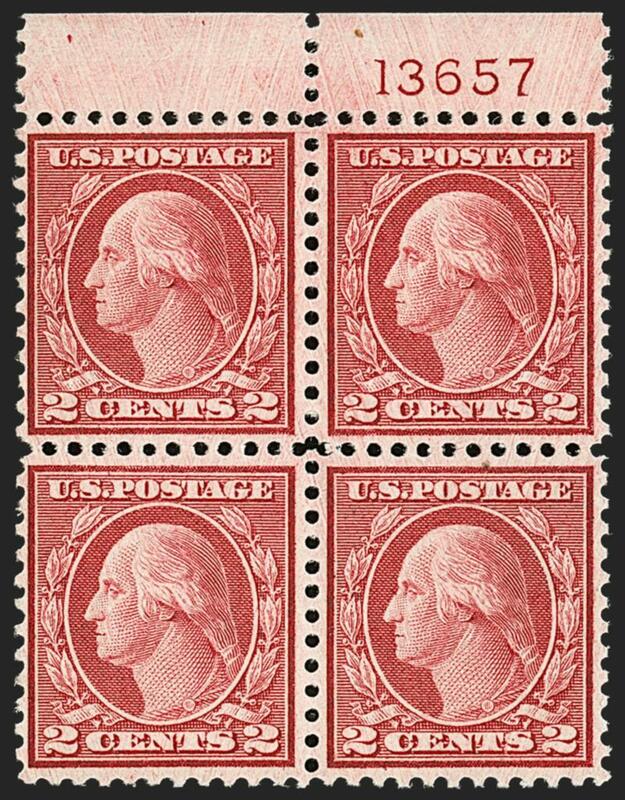 A smaller number were perforated 10 (Scott 467). 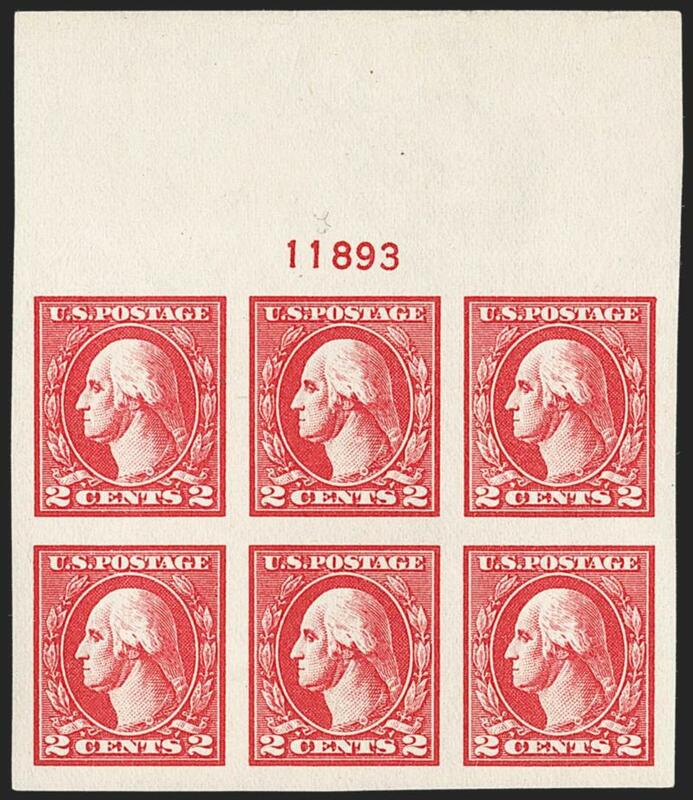 The rarest of the errors are the imperforate stamps (Scott 485). 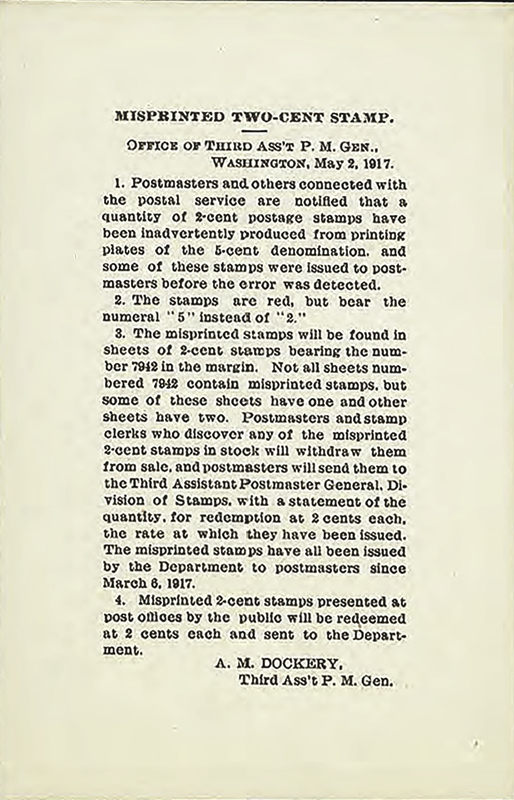 On May 2, 1917, the Third Assistant Postmaster General sent out a printed notice informing postmasters of the error and recalling the "mis-printed" sheets, but by then the red cats were out of the bag. The largest group of sheets discovered at one time were all imperforate, but they never made it to collectors. 755 imperforate sheets of 400 stamps (2,265 errors) were on their way to a company for private perforating when they were found in the Chicago post office and returned to Washington, D.C., for destruction. Three of the Chicago sheets were kept for the National Philatelic Collection. Philip H. Ward, Jr. later reported that he bought two sheets from John Klemann, a New York dealer, who said he acquired them from Joseph Leavy, curator of the national collection, but Klemann may have been lying about his source, since he was involved in the purchase and sale of the New York find of imperforate sheets--48 sheets of 400, also intended for private perforating. The hoard was found in a New York post office and bought in two stages (25 and 23) by Edgar Nelton, a stamp dealer. He and a partner named George Tuttle sought financing from Klemann and accepted becoming one-quarter partners (whether it was one-quarter each or together is unclear). Sometime later, Klemann reported to his partners that he sold most of the sheets to Col. Edward H. R. Green. Years later, Nelton's account reflected his bitterness over what he considered to be a poor financial outcome from the discovery and Klemann's role in the sale. It does not take much imagination to see that Klemann told his partners one thing and did another, taking more than his share by underreporting profits. 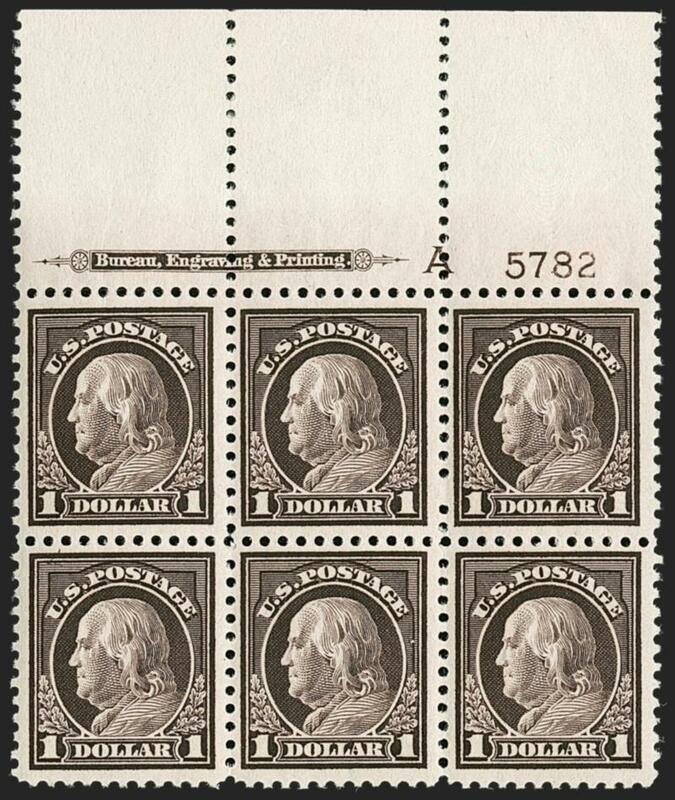 The $2.00 and $5.00 1918 Issue are the first bicolored dollar denominated postage stamps issued by the United States. 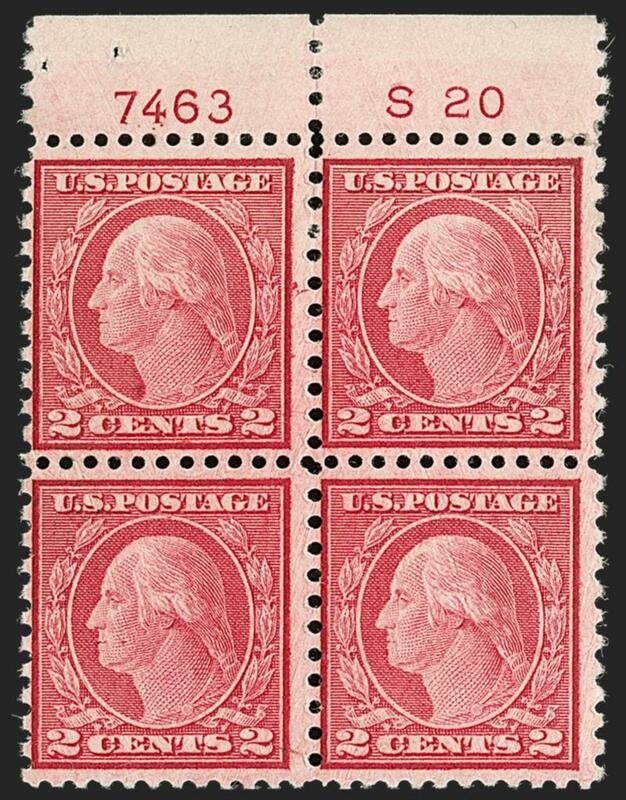 Both were released just three months after the famous 1918 24¢ Inverted Jenny, but the early printings were issued in small quantities, since stocks of the earlier $2.00 and $5.00 issues were still on hand. At the beginning or end of a coil-stamp print run from the 170-subject rotary plates, some leading or trailing paper was left over that was too short for rolling into 500-stamp rolls. 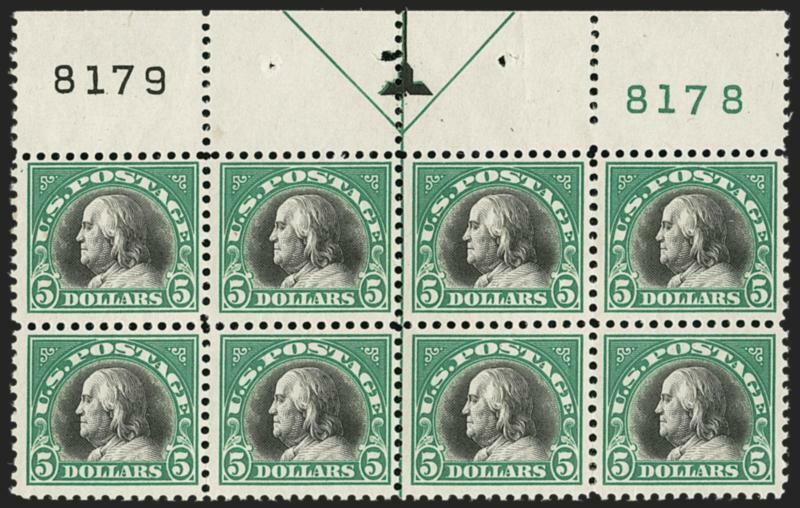 In 1919 the Bureau of Engraving and Printing devised an economical plan to salvage this waste by converting the leftovers from coil stamps into sheet stamps. This was accomplished by creating panes with perforations from the coil perforator in one direction and applying perforations in the other direction on the line perforator normally used for flat-plate sheet and booklet stamps. Fully perforated rotary waste stamps have either compound gauge perforations--in this case, 11 by 10--or are Perforated 11 all around. The 2¢ Type III design was produced on the rotary press in large quantities. 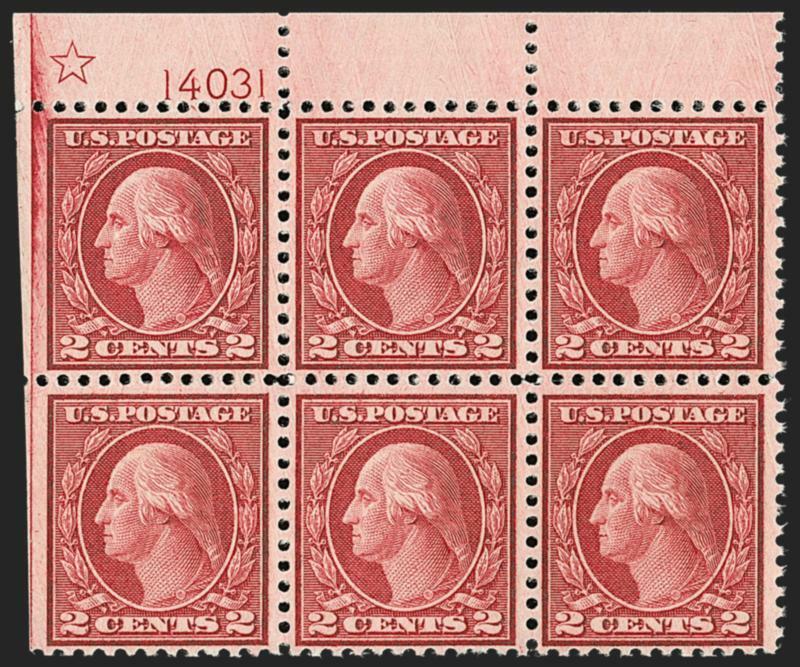 The Type II is scarce as a Perf 10 horizontal coil (Scott 491), and the sheet stamps made from the Type II horizontal coil waste (Scott 539) are also quite rare.